Betfair is offering BetAndSkill readers the choice of two huge price boosts for Saturday night’s Champions League Final! Find here how to get 40/1 Real Madrid or 60/1 Liverpool to win! Max bet €/£1! This is your best chance to make a profit on the Champions League final this year. You can win £40 or £60 through a £1 bet on Real Madrid or Liverpool respectively. 40/1 Real Madrid or 60/1 Liverpool to win! Get 40/1 Real Madrid or 60/1 Liverpool to win with Betfair! New Customers can get Real at an enhanced 40/1 to win 90 mins or Liverpool at 60/1. Max Stake £1. Winnings paid in free bets, valid for 7 days, only deposits with cards/Paypal count. Exchange and multiple bets excluded. T&C’s Apply. 18+|Gamble Aware. Register a new account with Betfair before the kick-off (7.45pm) and claim 40/1 Real Madrid or 60/1 Liverpool to win in the Champions League final - Massive prices!! If your selected team wins in 90 minutes, Betfair will pay out at the quoted price immediately. They will top up your additional winnings within 24hrs. Would you like to place a bet on tonight's Champions League games but don't know which betting site is the best? Betfair is the answer! They have had a Decade of Best Odds on every sport (best odds of 94% of main sport events since 2008). Real Madrid play in their 16th final, and with 12 of their 15 ending in victory they are clearly specialists in the big games. The last time these two sides met was in the group stages of the 2014/15 Champions League season. Madrid won 3-0 at Anfield before securing a 1-0 home win at the Bernabeu. Normal price on Real Madrid to win is 6/5, or 40/1 if you claim this offer! Liverpool have scored in all but one of their Champions League games this season. Their opponents have conceded at least two goals in four of their last five games and the Reds' front trio could be lethal. These two teams have only ever met on five occasions with Liverpool leading 3-2 on the head-to-heads. 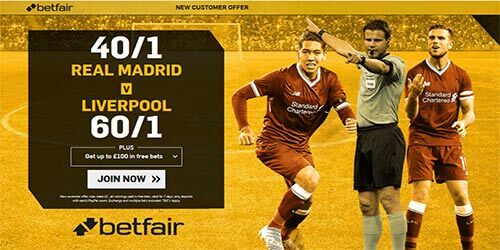 Betfair are offering all BetAndSkill readers a special price on Liverpool and Real Madrid to win the Champions League final, click here to get your crazy offer right now! Maximum bet available at enhanced odds is €/£1. Standard winnings are credited in cash based on the advertised price on Betfair website. You can use credit cards or Paypal to claim this offer. Moneybookers, Paysafe, Neteller and Skrill do not count. "Get 40/1 Real Madrid or 60/1 Liverpool to win at Betfair (Champions Leage final boost)"